Pioneers in the industry, we offer autofy center stand for all bikes, autofy scooty chrome fitting, autofy car led strips, autofy bike riding goggles and autofy bike levers from India. 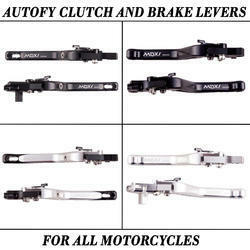 Autofy Centre Stands for all motorcycles is a must have bike part that is available at reasonable prices. The quality has not been compromised in the pursuit of budget pricing. The Iron (CRC) used in the manufacturing of the footrest assembly is developed using Cold Rolling process that involves rolling of iron below recrystallization temperature to improve the finishing of the surface along with 20% increase in the strength of the metal. The metal has been painted with anti-rust paint to fortify the assembly against deterioration caused by dust and moisture. Special care is taken while designing these after-market parts that they are of similar dimensions and fitments to ensure easy replacement by the buyer himself without any assistant from a professional mechanic. 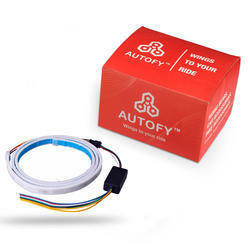 Please feel free to visit for more products videos by Autofy. 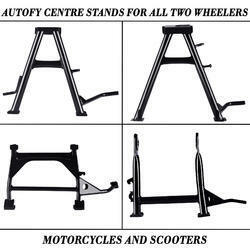 Autofy also manufactures Center stands for Honda Unicorn , Honda Dream Yuga, TVS Apache RTR, Hero Honda CD Deluxe , TVS XL Super, Bajaj CT 100, Bajaj Platina , Honda Activa , Yamaha FZ , TVS Victor , Kawasaki Bajaj 4S, Bajaj Caliber , Bajaj Pulsar DTSi Old Model, Bajaj Discover , Hero Honda CD 100 , Honda Shine and Hero Passion X Pro and many more. 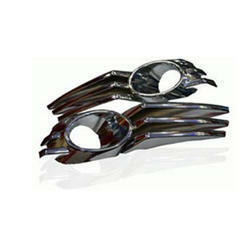 Autofy fog light chrome bezel are now available to you at a very reasonable and low price. These plates are only for Maruti Swift. These plates give your Swift an altogether new European style look. It is made from premium quality plastic with triple chrome finish to ensure clean shiny look lifelong. The plates are non-corrosive, anti-rust and waterproof. The bottom surface has US adhesive for perfect fit and lasting grip. The installation is very easy and can also be done at home. Autofy universal flexible 120 centimeter 96 LED car tail light strip / licence plate light strip brake stop turn signal light is the best product available at a very low and reasonable cost. These lights are fitted with multiple LEDs in a systematic pattern to throw a very sharp and bright light. Also, the LEDs in the light strip can be synced with the brakes as well as with the turn indicators, thereby enhancing not only the look of your bike but also its noticeability on the road thus making your drives safer than ever. Easy installation and installation that can be done at home. The flexible built of the light adds to the longer life of the light as it has been made up of plastic and rubber hence making it shatter proof, unlike other lights that consist of glass parts. The housing also has been designed to keep the light assembly waterproof, shockproof and dustproof. This light strip has been tested to work efficiently in Alto 800, Alto K10, Baleno, Celerio, Ciaz, Eeco, Ertiga, Gypsy, Omni, Ritz, S-Cross, Swift, Swift Dzire, Wagon R, Wagon R Stingray, Vitara Brezza, Aria, Bolt, Indica, Indigo eCS, Manza, Movus, Nano, Safari, Safari Strome, Sumo Gold, Vista, Xenon XT, Zest, Camry, Corolla Altis, Etios, Etios Liva, Fortuner, Innova, Land Cruser LC200, Land Cruiser Prado, Prius, Beetle, Jetta, Polo, Vento, Octavia, Rapid, Superb, Yeti, Duster, Fluence, Koleos, Kwid, Lodgy, Pulse, Scala, Micra, Sunny, Terrano, Pajero Sport, Aventura, Punto Evo, Linea classic, Linea classic, Force one, Ecosport, Endeavour, Figo, Figo Aspire, Amaze, Brio, City, CR-V, Jazz, Mobilio, Creta, Elantra, Eon, Grand i10, i10, i20 Elite, Santa Fe, Verna, Xcent, Bolero, Getaway, KUV100, Quanto, Ssangyong Rexton, Scorpio, Thar, TUV300, Verito, Verito Vibe and XUV500. 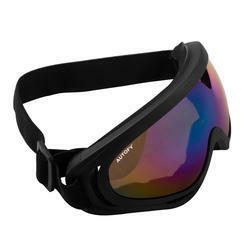 Autofy riding gear goggles in black colour gives you a more confident and clear riding experience. A recommended product for driving two wheelers, this is best suitable for both on-roading and off-roading riding activities. If you are looking forward to a bike mountain trips, highway trips, city trips, racing etc. this is something you cannot miss to ensure your protection from wind, dust etc. The premium quality polycarbonate lenses gives high transparency and a clear 180 degree vision. It gives resistance to water, wind, dust and other particulate matter. The outer poly carbonate surface protects from the environment while the inner prevents fogging. The silicone strap is anti-slip and adjustable. This is a highly used product by bike enthusiasts, biker lovers and biker boys who go love their bikes Royal Enfield Bullet Standard 350, Royal Enfield Bullet Standard 500, Royal Enfield Bullet Classic 350, Royal Enfield Bullet Classic 500, Royal Enfield Bullet Classic Desert Storm, Royal Enfield Bullet Electra, Royal Enfield Bullet Thunderbird 350, Royal Enfield Bullet Thunderbird 500, Avenger, Pulsar, Duke KTM, Harley Davidson, Yamaha FZ, R15, CBR, Ninja, Apache, Hayabusa and other bikes. Autofy Moxi lever with 6 adjustable modes is now available at a very low and reasonable price. This lever is made of premium quality CNC aluminium which makes it very tough and gives it the capability to withstand extreme conditions of shock. The cleanly plated polish makes it waterproof and oil repellent. The short and 6 adjustment levers are definitely better than the stock levers due to ease of adjustment according to the hand size. If you have a small hand switch to the 1st mode and make the pressing of clutch and brake easy. Now you will not have the problem of stretching your fingers, adjust the size from the 6 options and make your driving safe and easy. This is the best product for any rider going for highway rides, mountain rides, leading a bike gang etc. Professional installation is advised. The heavy metal can absorb shocks and withstand extreme weather conditions. The easy switch mechanism allows you to change the lever closeness according to your hand's size. These are designed for Yamaha R15 all models. The lever has a foldable pivot in the midway to flip up the lever when you park your vehicle to avoid crash and damage of clutch and brake lever which is a very common problem with levers.